On Saturday, 14 Poky Pedalers enjoyed a pleasant afternoon under spectacularly sunny skies on the Maple Ride. Considering that last year’s Maple Ride was canceled due to gusty, drizzly weather in the mid-40’s, and the 2013 version required hats and gloves to keep (somewhat) warm, we all appreciated the opportunity to ride our bicycles on a beautiful fall day with temperatures in the low-70’s. Our ride was filled with lovely scenery. Notable segments included the forested Green Circle gravel path along the Wisconsin River from Bliss Ave to Hwy HH and the paved multi-use path through tree-filled Pfiffner and Bukolt Parks. We had broad views of the Wisconsin River and the countless trees which line it as we crossed both the Hwy HH and Clark St bridges. We rode much of the length of both Center St and Prais St, two of Stevens Point’s most comfortable streets for bicycling with many attractive homes nestled among a bevy of trees. As much as we appreciated the innumerable trees showing fringes of fall color, the primary motivation for the Maple Ride is to discover streets named ‘Maple’, in whole or in part. From our starting location in Iverson Park, we got off to a good start as we rode on Maplewood Dr in Park Ridge. We found two more ‘Maples’ on our ride: Maple St just off Bliss Ave near the Stevens Point Dog Park, and W Mapleridge Dr near the old Jackson School on the west side of the Wisconsin River. Our ride also revealed an unexpected theme: trains blocking our route. 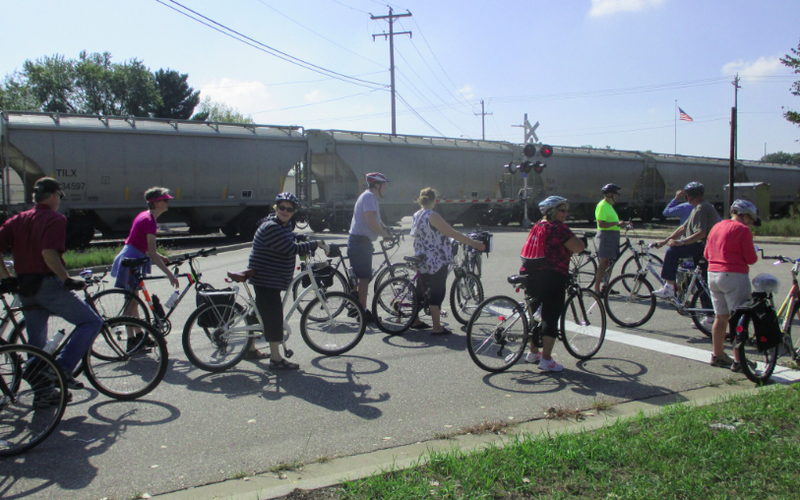 Over the course of our ride, our progress was impeded by trains in two different places. In one instance, we were blocked by a fast-moving train, so our delay was only a couple of minutes. But in the other instance, we came across a stopped train waiting to continue into the Patch St rail yards. My experience indicates that one can wait a very long time at such blockages, and there aren’t any good alternative routes. So we decided to wait a bit and see what happened. After about 5 minutes, the train started moving and its end could be seen in the distance. As our hopes soared that we could soon continue on our planned route, we noticed the train starting to slow. It came to another stop with its tail just a few hundred feet from the crossing. Faced with limited options, we embarked on the high-adventure portion of our ride where we walked our bikes past the end of the train and then over the tracks in order to proceed. Despite these train delays, all enjoyed a marvelous afternoon of bicycling. Our 13-mile loop, which included a snack stop at a convenience store halfway through, brought us back to Iverson Park. The Maple Ride, our last Poky Pedal for 2015, had come to an end. To celebrate this conclusion to our season of Poky Pedals, about half of our group chose to extend the pleasant day with an impromptu Bike Fun Banquet at the nearby Hilltop Pub. We took advantage of their outdoor patio to partake in their excellent food and beverages. This was a terrific way to cap off both a wonderful Maple Ride as well as the bounty of Poky Pedals comprising the 2015 Bike Fun Calendar. In a couple of weeks, I will post a recap of all the Bike Fun we shared this year, so look for that on the PPSP blog. I will also use the blog to continue covering local bikey news. 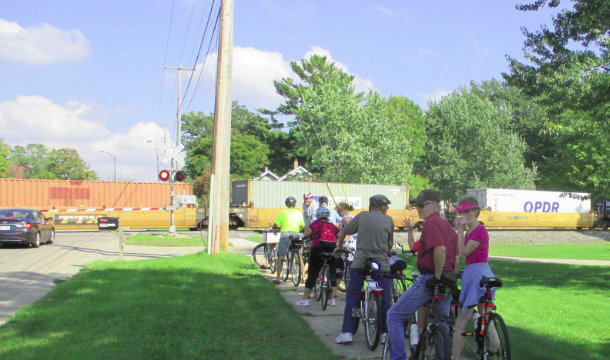 Due to recent bicycle-friendly actions by the city of Stevens Point – read here and here to learn more – there should be a steady stream of such news to report over the months to come. Looking further ahead, the 2016 Bike Fun Calendar should be available on the PPSP website in early April, announcing a new season of Poky Pedals starting next spring. The end of one year of Poky Pedals simply signals the start of our anticipation for the next year of Poky Pedals. I hope Poky Pedalers keep up with the PPSP blog as a distraction from the inevitable snow-covered landscapes of our near future. And after all the white stuff melts away, I look forward to sharing Bike Fun again with Poky Pedalers in 2016.